The weather has been glorious over the last few days, and at last we can all relax into summer. As usual the village green is a hive of activity over the warmer months. We’ve taken to eating supper in our front garden, glass of wine in hand, while watching the evening cricket match. Tonight’s dinner was all the more satisfying as the miscellany of leftovers in the fridge wondrously aligned to make a perfect summer salad. We had some cold chicken leftover from a roast and a bag of jersey royals that desperately wanted eating. Throw in some chopped shallots, spring onions, a generous dollop of aioli dressing and voila; the laziest midweek supper for a balmy summer’s evening. Start by boiling the potatoes in salted water, removing from the pan just before they are completely cooked (about 10 minutes). Drain and cover with a tea towel. Leave to cool. To make the dressing, whisk together the egg yolk and Dijon mustard, then very slowly add the oil, simultaneously pouring and whisking. Once the mixture has thickened, add the white vinegar, followed by the crème fraiche. 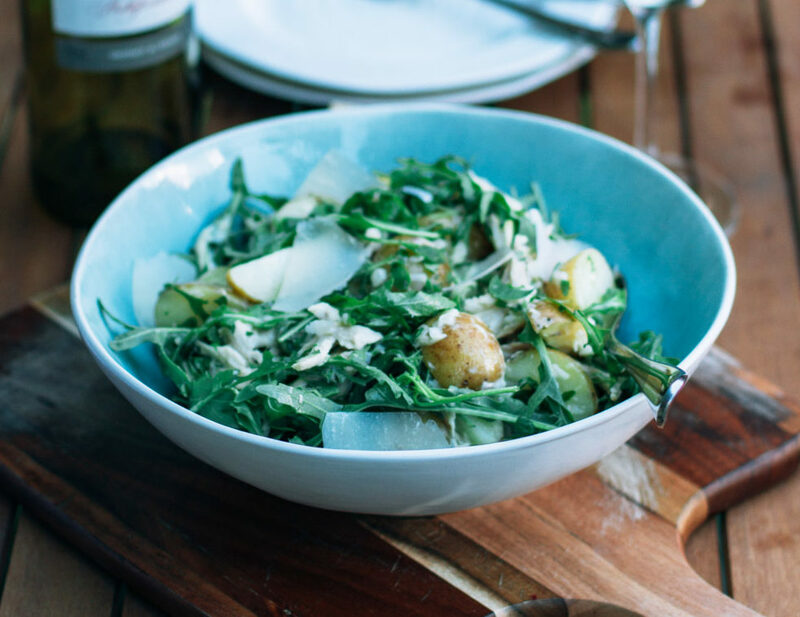 Mix the potatoes, chicken, spring onions, shallots, rocket, oregano and aioli dressing in large salad bowl. Grate over a few parmesan shaving and serve.